I was wondering about a story that a “Hebrew-Christian” told me recently. He said that there was a scarlet cloth which would turn white every year when the high priest atoned for the sins of the people. When Jesus died, around 30 A.D., the cloth would no longer turn white when the priest atoned for sins because Jesus was the final atonement. I’ve read this story in other sources, and I wondered what you have to say about it. This assertion with which you were confronted has, in the last decade, attracted wide interest in the evangelical world. In fact, I am somewhat surprised that it has taken this long for one of our website visitors to write in with this question. Despite the popularity this issue has gained in the Christian world in recent years, this contention stands out as one of the most bizarre arguments used by Christian apologists. What makes this line of reasoning so strange is that it seeks to use the Talmud to prove that Jesus is the messiah. While most are simply surprised to learn that missionaries would depend on the Talmud in order to prove the validity of the Christian religion, in reality, this misuse of rabbinic literature is widespread. Those who have navigated through the plethora of missionary tracts are well aware of how widespread this abuse of Jewish literature has become in recent years. Moreover, by probing this bizarre missionary approach, we can gain enormous insight into this strange tactic employed by overzealous missionaries committed to Jewish evangelism. Bear in mind, missionaries rarely shy away from an opportunity to condemn the Oral Law as the nimble work of men rather than the oral transmission handed down to us by Moses, our teacher. In fact, there are few issues that seem to produce the visceral passions of the Hebrew-Christian world as does the mere mention of the Talmud. These evangelicals fervently insist that the written Bible alone is reliable and divinely inspired, and often scornfully mock traditional Jews as practicing a “rabbinic Judaism.” Bear in mind, when Christians use the term “rabbinic Judaism,” it is never meant as a compliment. Paradoxically, whenever missionaries feel the urge to advance their position by quoting from the Talmud, they undergo a spontaneous conversion as they happily and unhesitatingly point to the works of the Talmud with a newfound regard for its truthfulness and inspiration. Yet the very same Talmud, which evangelicals gleefully use to advance their tenuous positions, also unambiguously states that Jesus of Nazareth was neither virtuous nor the messiah. This pick-and-choose approach that missionaries unflinchingly embrace doesn’t appear to deter those dedicated to Jewish evangelism. Citing the above statement, missionaries contend that the year the scarlet ribbon ceased to turn white coincides with the time that Jesus was crucified. After all, they argue, 40 years prior to the destruction of the Second Temple corresponds to the year 30 C.E,3 which is approximately the time of Jesus’ crucifixion. They conclude, therefore, that the cessation of the whitening of the scarlet ribbon clearly indicates that God was no longer accepting animal sacrifices, and the Jewish people, therefore, needed to turn to Jesus as their only avenue for atonement. Ultimately, this argument asserts that the reason why the scarlet strip of wool did not turn white in the year 30 C.E. was due to the fact that the sins of the Jews were not forgiven because they did not accept Jesus as their messiah. As unimaginable as it would seem, particularly for those readers who are familiar with this well-known section of the Talmud, this argument has gained widespread attention over the last few years. In fact, the first time I heard this polemic used I watched in disbelief as a spellbound church audience turned pale when their pastor excitedly expounded on this quote from the Talmud in his sermon. It was a particularly disheartening spectacle to observe. Had any one of the parishioners in the audience gone to the local library in order to examine this entire section of the Talmud, they would have grasped that this quote had been deliberately misapplied and crudely misused. Before we examine this statement in the Talmud, two important issues must be highlighted here. The first point is that it is my hope that my readers have noticed what those who advance this argument sought to accomplish. They attached an exegesis to the text of the Talmud that reflects a self-serving theology. In essence, missionaries are claiming that the reason why the strip of scarlet wool did not turn white must be attributed to the fact that the Jews rejected Jesus. This is a preposterous notion. In fact, if evangelicals wish to engage in this sophomoric approach, a far more congruous argument could be made here using their same line of reasoning. We can, utilizing the same course of logic, conclude that the reason the scarlet strip of wool did not turn white was due to the fact that masses of wayward Jews had followed the false messiah, Jesus of Nazareth. In other words, rather than attributing the reason for the scarlet strip of wool not turning white to the rejection of Jesus, it can be more steadily asserted that the reason this transformation did not occur was due to the fact that many Jewish people had tragically embraced Christianity. In fact, such an interpretation would be far more consistent with the whole of the Talmud. Bear in mind, I am not suggesting that this is the correct understanding of this Talmudic text. It is not. We shall soon see that this section of the Talmud is unrelated to either of these explanations. I have made this point, however, to illustrate the self serving nature of this circular missionary argument. The second point, however, presents a far more serious problem for Christian apologists. If in fact, as the “Hebrew-Christian” insisted, the reason that the scarlet wool strip did not turn white was “because Jesus was the final atonement,” and there was thus no longer any need for animal sacrifices, why then are the same animal sacrifices coming back in the End of Days? Christians have very little room to maneuver on this matter because the Bible is quite clear that the animal sacrificial system will be restored in the messianic age. In fact, in the last nine chapters of the Book of Ezekiel, the prophet describes in vivid detail the elaborate rituals and lofty ceremonies which will occur in the third and final messianic Temple. 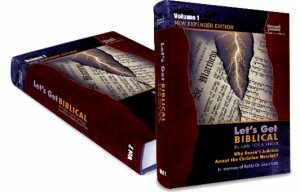 In chapters 43-44, Ezekiel clearly states that the animal sacrifices will be reinstated in their full glory. In fact, the messiah, who is called “the prince” seventeen times at the end of the Book of Ezekiel, will personally offer a sin offering in the future messianic temple (45:22). This simple fact should stir Christians to tremble before they consider suggesting that the transformation of the scarlet strip of wool had ceased due to the fact that God had done away with animal sacrifices. Clearly, God has not done away with them as evidenced by the fact that these elaborate Temple rituals will be restored with the advent of the messiah. Let us now examine the Talmudic discussion from which this quote is derived. As we will discover, this text was deliberately ripped out of context. Once this crucial background is fully restored and completely understood, it will be clear that this quote does nothing to support Christian theology. Tractate Yoma4 is devoted to the laws pertaining to the day of Yom Kippur. Although missionaries cite the above statement which appears on page 39b of this tractate, the discussion leading up to this quote begins on the previous page, 39a. Quoting from a Baraisa, the Talmud begins with a discussion of the deteriorating spiritual condition of the Jewish people during the Second Temple period. Throughout this fascinating discourse, the absence of miraculous events during the Temple ceremonies were the barometer by which the Baraisa measured the religious decline of the nation of Israel during this difficult epoch in Jewish history. The period of time examined in this assessment begins with the era during which Shimon HaTzaddik5 officiated as the high priest until the time that the Romans destroyed the Second Temple in the year 70 C.E. More specifically, the Talmud breaks this period down into three successive stages, with the first stage being the most meritorious, the second marking a gradual, spiraling, spiritual decline, and the third the most deleterious. The lot inscribed “LaHashem,” would always appear in the right hand of the high priest6 during the Yom Kippur service. The strip of scarlet-dyed wool which was tied to the head of the scapegoat always turned white during the Yom Kippur service. The western-most lamp of the Temple menorah remained lit until the priest would use its fire to kindle the next day’s lamps. The pyre on the altar did not require any additional wood to sustain a strong fire. There was a blessing upon the first fruits of the Omer, the two loaves offered on Shevuoth, and on the twelve loaves of the showbread so that each priest was satisfied with a portion no larger than the size of an olive. The faithfulness and goodwill that Shimon HaTzaddik engendered during his public tenure as high priest profoundly inspired his generation. His most famous maxim was, “The world exists on three things: the Torah, divine worship, and acts of kindness” (Pirkay Avot 1:2). He is described as a person who took great thought and consideration regarding his fellow man.7 His extraordinary character affected the people deeply, and this manifested itself with a host of miraculous phenomena which occurred in the Temple, the House of Shimon’s dedication. Following his death, however, the Jewish people were unable to sustain the spiritual heights which they had achieved during Shimon HaTzaddik’s lifetime. As a result, they regressed into a downward spiritual spiral from which they never recovered. This decline continued and worsened as the Second Temple era continued to unfold. The Baraisa therefore relates that after the death of Shimon HaTzaddik the occurrence of these miracles became sporadic. Although there were some years when these miraculous signs occurred, there were many others when they did not. This spiritual decay plunged to its lowest point during the last 40 years of the Second Temple period. The Baraisa records that none of the above miracles occurred during these last four decades of the Second Temple. The question that immediately comes to mind is: In what dreadful sins did the children of Israel indulge during these last ill-famed 40 years of the Second Temple that proved so devastating to their spiritual subsistence? What brought about the end of the miraculous events that were commonplace in the years that Shimon HaTzaddik served as high priest, and periodically in the years that followed his death? With virtually no knowledge of the works of the Talmud, missionaries argue that the scarlet ribbon did not turn white due to the crucifixion of Jesus. As you probably suspect by now, this contention is wholly without merit. Moreover, this Christian assertion entails a misuse of Jewish literature in order to advance a theology that is unknown to the Talmud. The Talmud, in fact, clearly and painfully records the sins that brought about the deplorable spiritual condition of the Jewish people during this last turbulent four decades of the second commonwealth. When quoting this Talmudic text, however, missionaries are careful to sidestep the crucial backdrop of this quote in the Talmud. By so doing, they deliberately deprive the unlettered listener of indispensable knowledge, and the vital tools to effectively respond to this argument. What makes the Christian use of this Talmudic quote so preposterous is the fact that the miracles in the Temple did not suddenly end in the year 30 C.E., as missionaries claim. On the contrary, the disappearance of miraculous phenomena began immediately following the death of Shimon HaTzaddik, which occurred many centuries before the destruction of the Second Temple. In essence, there was not a sudden, watershed event that caused the supernatural events in the Temple to end. The cessation of miraculous phenomena in the Temple was brought about by a slow spiritual decay among the Jewish people that lasted for many centuries. Under ordinary conditions, the court rarely carried out capital punishment. In fact, the Talmud proclaims that a Sanhedrin which put more than one person to death in 70 years was unflatteringly regarded as a “Killer Bais Din.”11 The Jewish judicial system was not set up for a lawless society where murder among the people of Israel was widespread. It is for this reason, and under these deplorable conditions, that the glory of the Temple was dimmed, the miracles in the sanctuary ceased, and the Sanhedrin withdrew itself from adjudicating capital punishment. Although the termination of miraculous events in the Temple was unrelated to Christian theology, it bore testimony to a time in history when Jewish people in great numbers turned against each other with baseless hatred. I will add one final note in order to bring all of the above parts together. To illustrate this final point, however, I will raise a number of basic questions. Bear in mind, missionaries insist that God had discontinued the animal sacrificial system and replaced it with Jesus’ sacrificial death on the cross. How can we know that the ending of the miraculous transformation of the scarlet ribbon was not connected to the ending of the animal sacrificial system, as missionaries contend? How can we be certain that the cessation of the whitening of the scarlet ribbon was entirely unrelated to the blood sacrificial system? Moreover, how can we be sure that the reason this miracle ended 40 years before the destruction of the Second Temple was due to the deplorable lack of social justice and brotherly kindness among the Jewish people? Finally, what is the meaning behind this mysterious ritual of tying a scarlet ribbon to the head of the scapegoat with the anticipation that it would miraculously turn white? To begin with, why was the wool of the ribbon dyed scarlet? Why didn’t they use a blue or green ribbon? Why would it have to turn white to indicate that their iniquities were cleansed? Moreover, how could the nation know that the marvelous transformation from scarlet to white was a clear indication that their sins had been forgiven? In essence, how do the colors scarlet and white relate to social justice and brotherly love? After all, nowhere in Leviticus 16, where Yom Kippur rituals are discussed, is there any mention of tying a scarlet thread to the head of the goat. This practice is a rabbinic tradition. What is the connection between the color of the ribbon and the spiritual state of the children of Israel? The answer to all these perplexing questions is addressed clearly in the Hebrew Bible. In the first chapter of the Book of Isaiah, the prophet harshly condemns the Jewish people for their woeful sins. Nowhere in this epic chapter does the prophet condemn his people for violating the Sabbath or eating unkosher food. This was not the spiritual crisis which confronted the nation. Rather, the prophet decries their lack of social justice – they had abandoned the destitute. This is the iniquity that robbed the people of a connection to God. They cast aside Judaism’s most cherished tenants, mindlessly turning against each other. The nation was indicted for its indifference to the needs of the most vulnerable members of society – the widow, the fatherless and the poor. With a visceral condemnation of his people, Isaiah berates the nation, employing biting words unparalleled in the Jewish Scriptures. He compares his people to Sodom and Gomorrah, and warns that if this is the manner with which you treat your fellow man, then God rejects your Sabbaths and New Moons. Now that we comprehend the prophet’s warm and unexpected message, we can now grasp why the miracle surrounding the transformation of the scarlet ribbon was uniquely connected to the atonement achieved through social justice and brotherly kindness, rather than blood atonement. If your sins, which are as red as the scarlet ribbon, are to be forgiven and become as white as snow, indulge in acts of kindness and put an end to murder and baseless hatred. These precious words fell on deaf ears during the final forty years of the Second Temple. Isaiah begins his opening chapter with a warning to his wayward nation that blood sacrifices could not atone for their grievous sins. He pleads with the people not to depend on these rituals. Thus, the moving portrait of the scarlet thread transforming to white stands as a living monument to the prophet’s inspiring message on bloodless atonement. Needless to say, this profound teaching deals a fatal blow to the core teachings of the Church. Whoever sacrifices a bull is like one who kills a man, and whoever offers a lamb, like one who breaks a dog’s neck; whoever makes a grain offering is like one who presents pig’s blood, and whoever burns frankincense, like one who worships an idol…. While Shimon HaTzaddik officiated for 40 years as high priest, the nation was inspired by his good will and they emulated him. As a result, the atonement outlined in Isaiah was efficacious, and the scarlet ribbon always turned white during his lifetime. The people knew that God had forgiven them. In the years that followed the death of Shimon HaTzaddik – the last surviving member of the Great Assembly – the people’s dedication to his golden rule gradually weakened. Consequently, while there were some years in which the ribbon turned white, there were many others in which it did not change color. Sadly, we can now also understand why 40 years prior to the destruction of the Second Temple this auspicious miracle ended. It was during these calamitous four decades when Isaiah’s words of condemnation were personified. Even as I write this letter, in the shadow of Yitzhak Rabin’s assassination, it is still difficult to imagine a time when baseless hatred could have become so widespread that murders had became commonplace among my people. I vividly recall the traumatic days that followed the death of Rabin. It seemed as though humanity was almost overcome by a sense of stunned bewilderment. Men and women wondered aloud how something like this could have happened. I recall how deeply people were stunned, not just by the fact that the leader of the Jewish State was assassinated, but even more appalling, it was a Jew who had committed this crime. How could this mindless hatred have emerged among Jews, people wondered. Yet it did. As we contemplate the despotic period that brought about the destruction of the Second Temple, let us free ourselves of this spiritual affliction and turn toward each other with Godly affection. May this repentance bring about the coming of the true messiah, quickly in our time.